Every year the Commonwealth Essay Competition inspires thousands of young writers from all over the world. Essays pour into the London office of the Royal Commonwealth Society in March every year. Once they have been registered and sorted, they are sent out to the twenty-four Examiners for judging. Winning an award or commendation is a considerable achievement for many entrants and something of which they can be justly proud. The Competition has been running for more than 100 years and it has become firmly established as a highly regarded and popular international education project, enjoying much esteem and support throughout the Commonwealth. The Director of the Connect UK Office in PNG, Mr Pablo Ganguli is delighted to announce that the Commonwealth Essay Competition winner from Papua New Guinea is a young girl called Susie Kutato. Susie has received a special certificate from the Royal Commonwealth Society of which Her Majesty The Queen is patron. The certificate states that she took part in the 2002 Commonwealth Essay Competition and has won a prize for the essay she had written. The prize for Susie is 50 British pounds which will be given to her shortly by Connect UK. Mr Ganguli said "Susie is a very bright student. When I heard the news that a girl from PNG was one of the winners of the 2002 competition I didnt expect such a young person to be the winner. When we went to see Susie a few weeks ago at her school to let her know that she has won a prize, she was feeling a bit shy but I am sure deep inside she was feeling proud. Her parents and teachers certainly were." Susie is currently studying at the Koiari Park Community School. Susie is 11 years old. Her parents are Dia and Frank Kutato and her little brother is called Sharp Frank (in the photo). The Headmaster of Koiari Park Community School (in the photo) is Mr. Barnabas Anga. The following is a quote from him: "I am proud that Susie, through her effort, put our school amongst the best. I will definitely be encouraging many more of my children to get involved with this [i.e. the Commonwealth Essay Competition]"
Susie's mother encouraged Susie to enter the competition after seeing the article in the paper as she always sets writing assignments for Susie over the school holidays to help improve her English. 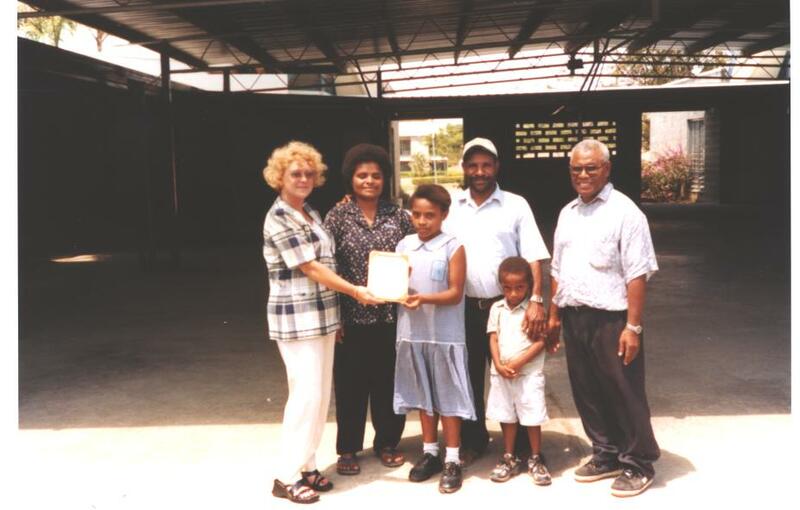 Mrs Kutato said: "I am very proud that at such an early age Susie has acheived something to help our family"
"I considered four essays for the Papua New Guinea local prize: Nii Lantey Bannerman, Class B, The International School of LAE, Jane Mgone, Class B, Intenational School of Lae, Chatura Galaniha, Class B, International School of Lae, and Susie Kutato, Class D, Koiari Park Community School. I was impressed with all three Class B essays. They were well written, well argued and well presented. They were also thoughtful and wise in their different ways. However I awarded the local prize to Susie Kutato........."this was a well planned and considered essay which endeavours to cover all aspects of the topic (planting a garden). Susie is logical, practical and clear. She takes great care. Her hand writing is easy to read, her grammar correct and her spelling good." The Head of Projects of Connect UK, Ms Carole Grotrian presented Susie with the Royal Commonwealth Society certificate a few days ago (in the photo).